Stainless Steel Swage Fittings offer corrosion resistance. Available to fit variety of wire rope sizes ranging from 1/32-Â½ in., Machine Swage Fittings are precision machined from grade 316 stainless steel and come in variety of styles including swage eye, swage jaw, plain ball, single shank ball, and double shank ball. Fittings are primarily used for marine and industrial rigging as well as applications where wire rope assemblies are needed. Plymouth, MA - - Suncor Stainless, Inc. has expanded their line of stainless steel machine swage fittings with the introduction of the swage eye, swage jaw, plain ball, single shank ball and double shank ball. A total of 43 new stainless steel swage fittings have been added to Suncor's ever-expanding line of machine swage hardware. After joining the elite ranks of companies in the U.S. Government's Quality Manufacturer's List (QML) in 2010, Suncor began the in-house production of Mil. Spec. swage terminals, including, forks, eyes, studs and shank balls made of grade 304 stainless steel. After receiving these certifications, they also began to manufacture a grade 316 version of these parts that are dimensionally similar. "The need to keep 316 parts that are similar to the Mil. Spec. parts is due to customer demand," says Jim Storrer, Engineering Manager at Suncor Stainless. "Customers want the dimensional accuracy and similarity to the Mil. Spec. swage fittings, but not the stringent control and higher price." These 43 swage fittings are offered to fit a variety of wire rope sizes ranging from 1/32" to 1/2". They are precision machined and made from grade 316 stainless steel, giving them maximum corrosion resistance and durability. These swage terminals are primarily used for marine and industrial rigging and applications where wire rope assemblies are needed. Throughout their existence, Suncor Stainless has been offering stainless steel hardware for do-it-yourself-enthusiasts and professionals alike. "We have introduced an economical and more corrosion resistant alternative to the Mil. Spec. swage components that we currently offer," says Patrick Striebel, President of Suncor Stainless. "These parts are for our customers that need a dimensionally similar component, but do not require the Mil. Spec. certification." Suncor Stainless has a network of dealers throughout the United States that offer these stainless steel swage fittings and other quality hardware. Please contact a Suncor Sales Representative to find a dealer near you. To learn more about these swage fittings or other Suncor Stainless hardware, please visit www.suncorstainless.com or call (800) 394-2222. Suncor Stainless, Inc. is a leading manufacturer for stainless steel hardware in the industrial, marine, government, architectural, OEM and commercial industries. 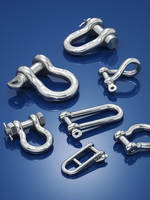 Suncor's modern facilities manufacture the highest quality stainless steel chain, wire rope assemblies and custom parts. The in-house capabilities include a product development staff, whose tireless efforts along with valuable input from clients, work to continuously improve and perfect their ever-expanding product line.